California’s unemployment rate was at 5.6% in August 2016, down from the previous month and well below 6.5% one year ago. The unemployment rate will likely rise as prospective employees slowly return to the labor force. As of August, the labor force participation (LFP) rate is at 62.7%, up from a year earlier. This is the highest LFP since 2013 and it is expected to increase steadily — a trend that will outpace job creation and drive up unemployment rates. A higher participation rate means prospective employees are gaining a more positive perception of the job market. 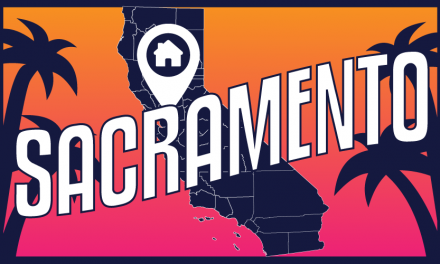 As Californians become more confident a job is attainable (or retainable), the housing industry will experience increased buyer-occupant participation. Further, though labor force participation will increase faster than job creation and, thus, stall wage increases, the return of Californians to the job market is nonetheless prophetic of solid job growth and an eventual rise in home sales volume. The most recent peak month for unemployment was January 2010, when 2,350,200 people were registered as unemployed in California, a 12.7% unemployment rate. Excluded from these unemployment numbers are individuals who have dropped out of the labor force entirely, either for retirement or lack of available work. The labor force participation (LFP) rate tracks the percentage of the state population who are actively working or looking for work. This rate has undergone a nearly-constant decline since the start of the 2008 recession, flattening out during the past 12 months. However, the LFP rate is expected to rise as Californians return to the job market, which bodes well for home sales volume in the next few years. Nonetheless, some individuals will remain unemployed longer. 18.2% of those unemployed in August 2016 had been without work for 52 weeks (one year) or more. These individuals will face great difficulty ever getting a job, one of the tragedies of government’s failure to fulfill its role as the employer of last resort in recessions. Glancing at the chart above, the cycle of joblessness as it is tied to economic booms and recessions over the past 30 years is apparent. Unemployment in 2011 lingered at a higher percentage of the total labor force than at any time in recent history. This was the sharpest spike in unemployment since the Great Depression, brought on by the 2008 recession and financial crisis. Unemployment began to decrease in 2012 and remains low in 2016. However, unemployment will not be down to acceptable levels until the 2018 period. Labor force participation will pick up and initially manifest as increased unemployment numbers for a year or two. At the same time, job growth will gain the momentum needed to bring the state’s growing population up to full employment. Of all the factors affecting California real estate, employment has the most impact. This is true in good economic times, times of economic recession and times of financial crisis. Without jobs, wage earners have no financial ability to make rent or mortgage payments. Thus, the unemployed are forced to move in with relatives or friends, negatively impacting the rental, home resale and construction markets. All indicators point toward a prolonged wait before sufficient jobs begin to return to the California labor market to eventually spur a normal housing demand. Thus, most of the slower-than-usual recovery of lost jobs experienced these past five plus years is behind us. By extension, we have endured a lack of occupying-buyers and tenants for all types of real estate. An exception is residential rentals in coastal areas. High rates of workers were pushed involuntarily from full-time to part-time employment by the 2008 recession. 950,000 California employees in August 2016 – 5.3% of employed workers – reported they were working part time for “economic reasons.” In addition, the majority of 2009’s massive job losses were not simply temporary layoffs; they have become permanent as reported by the Federal Reserve Bank of San Francisco (FRBSF). This premature permanent retirement from the work force will benefit landlords of modest rental properties, not sellers of real estate. A higher-than-normal rate of involuntary part-time work will interfere with employers hiring new workers. High levels of part-time workers cause employers to fill new full-time positions with current temporary and part time workers. Worse, 18.2% of CA’s unemployed have been jobless for 52 weeks (one year) or more, as of August 2016. They have little chance of employment for years to come when labor again becomes scarce. During “ordinary” recessions, the wages of permanent employees generally continue to rise, but do so at a much slower rate, staying under the rate of inflation. This allows employers to cut operating costs without damaging the overall morale of their employees. But the financial crisis brought deflation in the prices of goods and services sold. This condition forced employers to drop wages and hours worked in order to compensate for their leaner sales. As for California, average weekly overtime hours in manufacturing leveled out in 2013 at 41.1 hours — unchanged since 2011 — and have likely displayed little upward movement since. This is a sign that employers have begun in earnest their quest to add employees, reflected in the generally increasing annual rate of new employees monthly in California. Full employment involves a high level of full-time (40-hour week) employees. On the other hand, under employment occurs for those workers pushed from full-time to part-time (as with those employed in manufacturing and construction). Also under employed are those who experience shorter work weeks (as with those working for the state government), temporary layoffs and low overtime. Further, under employment occurs when highly skilled workers take lower-paying jobs to supplement a career loss. Under employment is a separate phenomenon from unemployment. Under employment means hours worked per week are cut, while unemployment means a permanent, unpaid vacation. However, underemployment and unemployment must both be considered in order to gauge the pace of recovery to full-time jobs. Why? When the economy begins to bounce back as it did in 2012, employers will not react to improved business by immediately hiring new workers. Thus, brokers will be left with the same, flat number of families qualified for home loans and rent in 2016. Employment numbers returned to pre-recession levels in 2014. However, with the intervening population increase of 1.2 million working-age individuals, it will likely be 2018 or 2019 when employment is truly recovered. 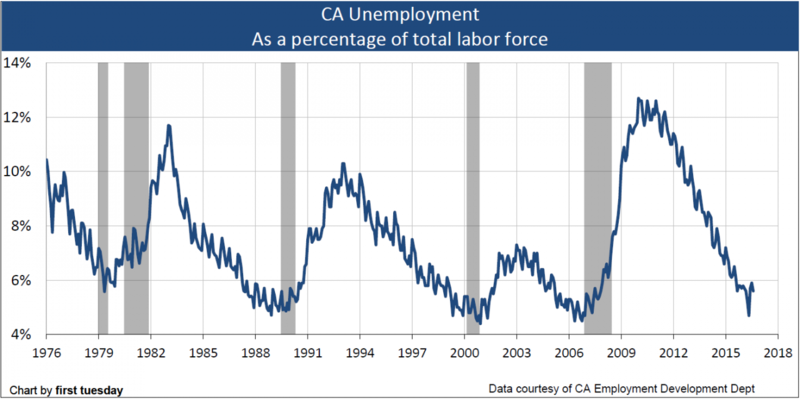 For the ever-increasing population of California (around 400,000 annually since 2007), the coming job recovery translates into a long period of unemployment for those who enter the labor force and do not quickly find a job. Rate of Population Growth: CA v. U.S. The spikes in unemployment of 1983 and 1993 each took over five years before full recovery; this one will take three years longer, well into 2016. In the meantime, any news of job recovery released for the nation as a whole will differ wildly from what most Californians will experience. Further, jobs vary by region in California. Therefore, watch particular areas for the best employment data of when local jobs will fully recover (Bay area versus San Bernardino). Real estate’s recovery, too, will wait for the inevitable rise in employment to create homebuyers and tenants. Unemployment in California will not stabilize until well into 2016. All the while, California unemployment will be reported at relatively high levels until the 2018-2019 period. Ten years of population growth since 2007 totals around 4,000,000 additional residents to make room for during this extended recovery, nearly 1,800,000 needing jobs. Full employment involves a large number of full-time (40-hour week) employees with a high amount of overtime hours (2 to 4 hours weekly). On the other hand, workers pushed from full-time to part-time (as with those employed in manufacturing and construction), shorter work weeks (as with those working for the government), low levels of temporary layoffs and low overtime all point to underemployment. Underemployment, which refers to the number of hours worked per week, is a separate phenomenon from unemployment, which refers to a permanent unpaid vacation. However, underemployment and unemployment must both be considered in order to gauge the pace of recovery to full-time jobs, the prerequisite to a robust real estate leasing and sales market. The reason: when the economy does begin to bounce back, employers will not react to improved business by immediately hiring new workers. Brokers will have to continue to wait for some time before the next wave of families qualifies for home loans or rent. Unemployment has remained at a higher percentage of the work force for the past two years than it has been since WWII, and it is worse in California than in the rest of the nation. The spikes in unemployment of 1983 and 1993 each took over five years before full recovery; this one will take two or three years longer, well into 2016. In the meantime, any news of job recovery released for the nation as a whole will differ wildly from what most Californians will experience. Real estate’s recovery, too, will wait for the inevitable rise in employment. To put it bluntly, the financial crisis will be embarrassingly long and financially troublesome for those impatient and overly-optimistic folks expecting a quick recovery – and easy profits. And unlike the “garden-variety” business recessions of recent years, this recession and its concurrent financial crisis are destined to affect the real estate market much longer than any recession since the Great Depression – sales volume will remain essentially flat through 2015. Unemployment in California will not stabilize until well into 2015, and it will take until 2016 to regain the 1,060,800 jobs lost (as of November 2011) and return to the December 2007 peak in California employment. NextMay rental property owners refuse to perform on a tenant’s purchase option due to an alleged breach which occurred 30 years before? As we all know by now, those persons who have ceased looking for employment are NOT counted in the statistics, and those persons are great in number. That means the TRUE unemployment figures are MUCH higher than the mere 11% the government loves to quote. Some sources place it between 16 and 20%, possibly more. Add to that the massive numbers of non-documented aliens in California who work in the shadow economy—or now, who DON’T work in that shadow economy, because they cannot find much work—and you get figures rivaling the Great Depression of the 1930’s. The banking elite planned it all, caused it all, and sought to crush the common man into financial subservience. The whole system they have in place is based on fractional reserve banking—the biggest ponzi scheme in the history of the world—where money is created out of thin air. The contrived “housing collapse” played a significant role in achieving their ends. Do their methods serve the common citizen? They DO NOT! They serve to enrich the banking elite and its inner circle while impoverishing the people of America. But, due to the growing LIBOR scandal, hundreds of lawsuits are being brought against the Banking Cartel by local, state, and federal authorities. These vile parasites whose only interest is in enriching themselves, will be brought to justice finally, but not after having almost collapsed the entire economy of the Western world. ditto to this reply!!!!! Absolutely right on. It is too bad that California cannot declare bankruptcy and just start over, because that appears to be the only way of the hole dug over so many years by vested interests.